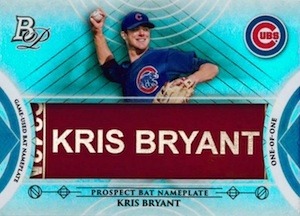 2014 Bowman Platinum Baseball offers a slightly more upscale take on the games rookies and prospects than regular Bowman. 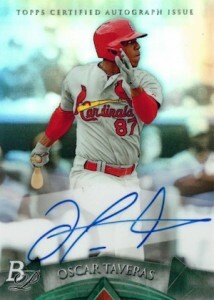 It also has a more enticing configuration for collectors who prefer more autographs and hits. Hobby boxes promise a pair of Prospect Autographs as well as an Autographed Relic. Printed on rainbow foil stock, the 2014 Bowman Platinum base set features both rookies and veterans. Parallels include Gold, Blue Sapphire, Ruby and one-of-one Printing Plates. The design is very minimal, which allows for the player and the foil to be the focal point. The 100-card Prospect insert set has a similar design and its own mix of Refractor parallels: Refractors, X-Fractors, Green (#/399), Blue (#/199), Gold (#/50), Orange (#/25), Atomic (#/5), Printing Plates and Superfractors (1/1). The two-per-box Prospect Autographs are all done as Refractors. Besides basic Refractors, several parallels add a chase element: Green (#/399), Blue (#/199), Gold (#/50), Red (#/25), Black (#/10), Atomic (#/5), Printing Plates and Superfractors. Multi-signature cards come with two, three and six autographs. Purely Platinum Autographs return. These one-of-one cards are printed on a metal-like stock and are exclusive to hobby packs. Now in its third year, Bowman Black Autographs run throughout all 2014 Bowman baseball products. Signed in silver ink, cards are numbered to 25. 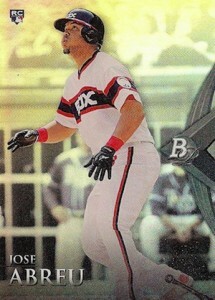 Topps has also added a Violet parallel that is numbered to 10. Autographed Relic and Autographed Jumbo Relics combine to fall one per box. Like regular autographs, these are done as Refractors and come with several parallels that are numbered as high as 199 going all the way down to one-of-one Superfractors. New Autographed Platinum Cut Relics come numbered to 49. 2014 Bowman Platinum Baseball has several die-cut inserts. The main one is called Toolsy. These highlight the five talents that go into a top prospect. Arm, Average, Fielding, Power and Speed each have their own Toolsy card. There is also a special 5-Tool version that features prospects that excel in all five areas. 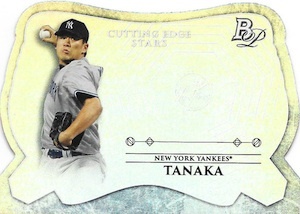 Cutting Edge Stars is another die-cut set, this time focusing on rookies and veterans. 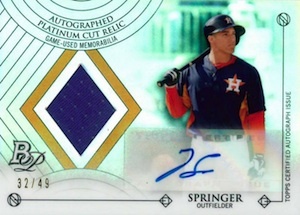 Parallels iclude Die-Cut Relics (#/50) and Die-Cut Autographs (#/25). Top Propects includes both Die-Cut (#/25) and Die-Cut Autograph (#/5) versions. 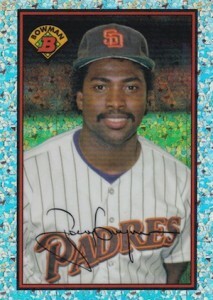 The 1989 Bowman Is Back Silver Diamond Refractor program continues, as it will throughout all 2014 Bowman baseball sets. In addition to regular cards done with the 1989 design, there are hobby-only Black Refractor Autographs that are numbered to 25. The high-end chase includes Prospect Bat Plates (1/1) and redemptions for full pieces of Arizona Fall League All-Star Memorabilia. 2014 Bowman Platinum Baseball also has a contest where the grand prize is a behind-the-scenes look at the 2014 Bowman Fall Stars Game. MOOKIE BETTS 2014 BOWMAN PLATINUM ROOKIE GAME JERSEY AUTOGRAPH -RED SOX!! 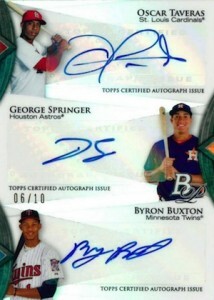 2014 Bowman Platinum #BPP10- Byron Buxton Rookie Card! PSA MINT 9! 100 cards. Shop for complete base sets. 100 cards. Shop for complete prospect sets. 42 cards. View a complete visual guide here. Serial Numbered #/25, Hobby only. 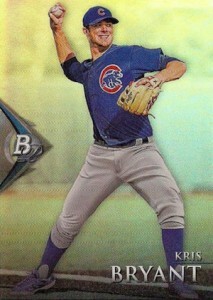 First released in 2014 Bowman Inception, the card showcases the 2013 Bowman Chrome design. 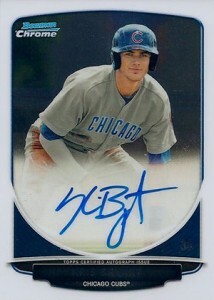 Good: More autographs per box than basic Bowman and Bowman Chrome, additional opportunities for 2013 Bowman Draft Kris Bryant autographs, on-card autographs, basic inserts are interesting. Bad: Photographs are too plain for nearly borderless design, foil is a step down from chromium, lack of consistency in parallels. The Bottom Line: 2014 Bowman Platinum is an alternative for those who think that basic Bowman is a little too pricey and risky for a guarantee of just one autograph per hobby box. Platinum autographs may not carry the same prestige as their Chrome counterparts but they’re still on-card and they still have a lot of colorful parallels. Overall, it’s a solid product with some decent potential hits but one that will likely get lost in the shuffle to a certain extent over time. The near full-bleed design of the base set really lets the foil background standout. However, it also feels very plain. The simple text used for the name blends right in with the card. 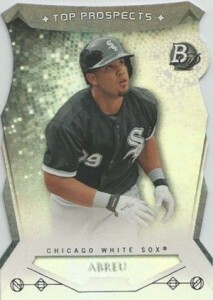 The Bowman Platinum logo on the side is definitely different, but combined with the arrow and it stands out too much. In many instances my eyes were drawn to the arrow first rather than the player, which I doubt was the intention. Not helping matters is the fact that the majority of the photos are very generic pitcher and batter poses. Die-cuts are going the route of mini inserts. They were cool at first but now there are so many that they’re losing their impact. That being said, I like the Cutting Edge Stars. Normally, I’m not a fan of cards that are largely plain in the middle. But the combination of die-cut edges and foil are enough to make it work. Plus, in the past, spaces like these were often designed as placeholders for autographs and memorabilia spots. That’s not the case here so there’s not that nagging feeling of backward design. I do like die-cut cards, but they seem to be everywhere. I think it’d make Bowman Platinum stronger if something like this became a focal point for the brand rather than spreading them out into nearly every release. from previous years. 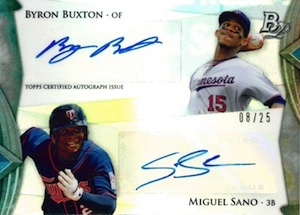 It’s doubtful that many collectors are going to roll their eyes at landing an on-card signature from the likes of Byron Buxton, Oscar Taveras or Miguel Sano, but their not nearly as exciting a year or two after their Bowman Chrome debuts. There are a couple of very notable exceptions in Jose Abreu and, to a certain extent, Kris Bryant. The inclusion of more 2013 Bowman Draft Bryant autographs is also a nice extra. Given the fact that you get triple the autographs as the average 2014 Bowman Baseball box for not a ton more, 2014 Bowman Platinum is solid. It also feels a lot less risky. While the Prospect Autographs don’t carry nearly as much clout as their Chrome counterparts, they’re still solid (and mostly on-card). The inclusion of more 2013 Bowman Draft Kris Bryant autographs still feels odd but it’s tough to complain about the possibility of pulling one of the top autographs of the year. Outside of a few exceptions, you’re not going to get blown away with pulls from Platinum, but you shouldn’t do horrible in a worst-case scenario either. 2014 Bowman Platinum is solid. The largely affordable mix of prospects and key stars makes for solid players. However, it’s not something that really stands out. I like that there are a few basic inserts to break up the color parallel chase. And on-card autographs galore are also welcome. But with more Bowman-branded products than ever, this one seems a little lost in the shuffle between base Bowman/Bowman Chrome and Bowman Inception. I’d like to see a new wrinkle added to make it different from not only other Bowman products but additional brands as well. Maybe by exploring card stocks or taking the die-cut inserts more of an anchor point could be a start. I’ll probably end up buying some anyway, but I think Topps has finally overdone it… for their sake, I hope the cards are much nicer live than the sell sheet portrays because these samples are simply unattractive, not to mention with exception of a very small few which will probably be short printed – it’s the same old rehashed prospects from previous years. I purchased three 2014 Platinum blaster boxes. Last year I was finding a lot of autographs in 2013 retail packs. Those were mostly the base autos, although it’s still fun to only open a few packs and have a good chance of finding an autograph. So far not much to rave about with the 2014 Platinum blasters, although I will probably splurge for a couple of hobby boxes in hopes of finding something of interest. Wilson � We’ll look into it and see if we can get any details. I have purchased only 2 boxes and I feel like I’ve gotten my moneys worth for sure. One box had printing plate and Buxton auto relic which is great for a Twins fan like me. My other box gifted me a Mark Appel bowman black auto SP. While I’m delighted for Chris, the product feels like a complete re-hash. 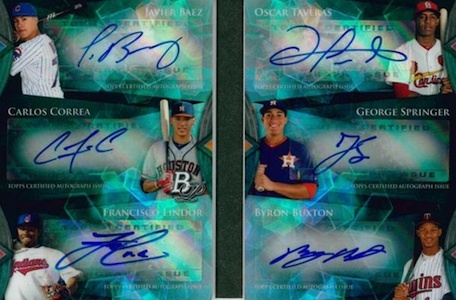 While Abreu, Correa, Buxton, Baez and Appel autos would make any collector happy, the checklist has a lengthy roster of dated prospects…and the card stock is a bit flimsy for the price-point. As a rookie speculator, I have always enjoyed breaking Bowman products… but this is one release that I will not purchase any more of. Thanks a lot, since I got a Billy Hamilton Canary Diamond rc Auto patch Redemption Card and wonder if its a 1 of 1 thanks! I need some help with a card, my dad recently bought a rack pack and pulled a card I’ve never seen and none on eBay. 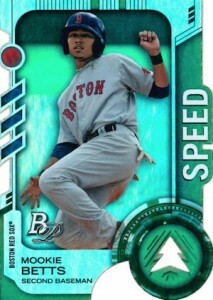 It’s the 1989 retro superfractor of pedroia. I looked it up and only 9 players have a retro superfractor. Any idea what it’s value could be? I bought two boxes and got a Buxton auto redeption card as well as Kris Bryant Prospect Bat Nameplate (1/1) which made me very satisfied. I bought a case. There was NO notable rookies in the 12 auto relics I got. Even the autos in the batch were crap. All of the relic cards were selling for $2 on ebay. This is an over priced and disappointing. Even the inserts are not numbered and they are crap also. I will never buy this product again. I was fooled on the 2013 Bowman Platimun and now I was fooled again by the 2014 batch. NEVER AGAIN!! 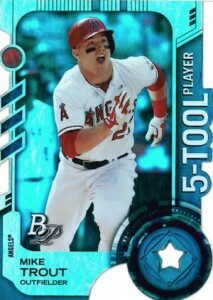 Those “5-Tool Players” die-cut inserts are horrible to get into plastics. Absolutely destroyed one of them trying for minutes to get it to slide in the sleeve. Guess I could’ve sliced open one side of the plastic. Anyway…love Platinum because of the value for how nice the cards look. You can get blaster boxes not that long after release on the usual sites for as low as around $10 and get an auto in every 3-sometimes way easier depending on the batch you get in a given case. I know the prospects need to be respected but realistically when I buy a product I want a fair value and getting a relic sticker auto of a prospect who is ranked 300th is not my idea of a fair deal. The company is taking the cheap way out by getting autos from prospects who will sign for almost nothing. I did get some decent cards but definitely not 75 dollars worth. This product is a gamble. Most of the autos go for 5-10 bucks on Ebay. 2014 Bowman Platinum Factory Sealed Baseball Hobby Box Carlos Correa AUTO ?